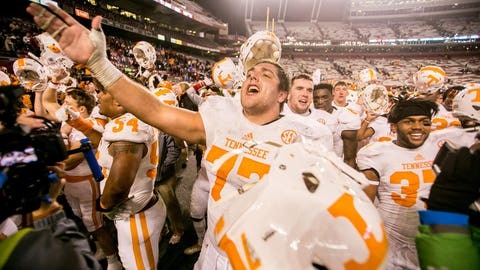 Tennessee's players expect nothing else but to win out, finishing the season at 8-4. Tennessee’s overall (3-4) and conference record (1-2) match those of its in-state rival Vanderbilt after the first seven games of the season. Despite the less than stellar results, the Volunteers appear confident heading into the backend of the schedule. One look at the remaining opponents and you’d likely feel the same. The next five games for Tennessee are about as easy of a slate a SEC team can ask for: at Kentucky, South Carolina, North Texas, at Missouri and finally Vanderbilt at home in the season finale. Win out and Tennessee would finish the regular season with a 8-4 record. Two players in particular seem to believe that’s going to happen. Following the Alabama game, senior offensive lineman Kyler Kerbyson was asked his thoughts on if the team is confident in its ability to win out. "Definitely, definitely. We are in a five game playoff now," Kerbyson said. "I’m not going to lose another game in a Tennessee uniform. I want to win out as a senior. I think everyone else feels that way too." Echoing those sentiments was sophomore receiver Josh Smith. "We’ve got five more weeks left and we’ve just got to attack those like any other game. If this doesn’t prove that we can play with any team in the country, then I don’t know what to tell you," Smith said. "We’re one of the top five teams in the country, easily, in my opinion. We’re right there. Stats don’t lie." While you may think the emotion of the close loss is playing into the player’s words, the stats suggest Tennessee has a great opportunity to close out its season on a very high note. According to ESPN’s Football Power Index – which measures a team’s strength against the strength of its remaining opponents – the Vols have a 50.3-percent chance of winning the last five games on the schedule, which ranks as the highest probability of any FBS team in the nation. The Commodores and Volunteers may stand on equal footing as of Oct. 25, there’s reason to believe a month from now could be a much different story.